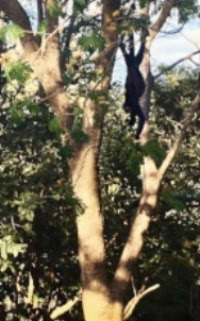 I was sitting in my backyard the other day watching a monkey hang upside down by his tail from a tree and eat leaves. He was just looking at me, showing me his belly, and chomping away. As I snapped his picture, I began to think, does this little guy have a plan? He’s several feet off the ground, hanging upside down by his tail, without, what would seem, a care in the world…where will he go next? Eventually he reached out and grabbed a nearby branch and swung over to the next tree which promised more leaves for his dining pleasure. In a few short moments, this small monkey had taught me a lot. He and his tribe of howler monkeys didn't seem too worried about what would come next for them in life. They moved from branch to branch and from tree to tree with grace and, what appeared to be, self-assuredness. These monkeys seem so natural in the trees so far off the ground, swinging and flying and grabbing and readjusting. They seemed to me this day to be so full of trust. Trusting in what’s next. Trusting in the knowingness of their ability to find the next branch without much planning. It’s as if they know the branch they need will be there when they need it. As we exit 2017 and enter a new year, this is a good time to reflect on what we no longer wish to carry with us. What part of our selves and what outdated habits will we let end with 2017? What new branches will we choose to swing to in 2018? This past year was a big one. For me I can sum 2017 up in one word; intense. America alone began it’s year with a massive political division; a divided country in so many ways. We saw some very potent eclipses in the spring and summer and we rounded the year out with hurricanes, floods and wild fires. No matter where you live you most likely felt the effects of some or all of these events. I find, as humans, we live more collectively than we would like to believe. We are more empathic than we think. What affects one of us affects all of us. Think of throwing a pebble in a pond. Eventually the ripples will reach the sides, no matter how small the pebble or how little the ripple. In short, we’re all in this together and 2017 has made us stronger from all it’s intensity and forced change. And now, for this new year, what will you do to bring about all that you would like to manifest? 2017 brought about a lot of shifting and clearing. Our closets have been cleaned out, so to speak. What will you fill them with now? How can you use these shifts from this past year to move your life into more alignment with your spirit? For me, 2017 rounded itself out with a move for myself and my wife Abby to the sweet country of Costa Rica. Abby manifested a job she had been dreaming up at a retreat center that has embraced us with open arms. Abby and I and our two kitties enjoy watching people heal their hearts each week here while living amongst howler monkeys, giant grasshoppers and some really amazing people. What a life! I am so truly grateful and would like to pass on a few helpful hints for you to manifest your next beautiful prayer. 1.) Get clear on what you are manifesting, what ever it is, just remember to be simple, clear and specific. 2.) Envision the person, place or thing you are manifesting happening now and FEEL how this feels in your body. Really tune in to the physical sensations. 3.) Be in gratitude for your prayer already having come true. Here’s an example: Abby and I wanted to manifest a car here in Costa Rica. Buying a car here seems a bit more daunting than in the US so I was beginning to get overwhelmed and confused, putting off the idea for some distant date when the car would just magically appear in my life. Sound familiar? When I realized this was happening, I got more clear on the car itself. I envisioned the type of car that would be good for us, I wrote down the price that we would be comfortable paying, I asked that we not have to go too far to find the car and set out the intention that the car come easily for us and benefit all parties involved. Next I sat with my eyes closed and envisioned having the car in my life and tuned into how my body felt knowing that I owned a car here. How did it feel to have this wonderful car? I felt tingly and happy and bubbly. I felt it in my stomach. It felt child- like to me and exciting. With this feeling in tow, I began to thank my spirit and the land of Costa Rica for my new car. I thanked all the parties involved in the finding of and selling of the car. I did this several times over the course of a week. One night about a week and a half later, Abby and I went to dinner at our favorite neighborhood restaurant. We’d become friendly with the owner and began to chat with him. We just told him in passing that we had been wanting to find a good car to buy. He said he had a car he wanted to sell. The price he quoted happened to be the exact price we had in mind. He was just down the road from us and would benefit greatly from the transaction too. So, all of my prayers had been answered and the manifestation of our car in Costa Rica was in full swing. The art of prayerful manifestation is not magic or any big “secret”, it is something everyone can do. So why not make 2018 a year of manifesting all that you can dream up? Remember the monkeys, swinging from branch to branch with trust and self-assuredness, knowing the next right branch will be there when they are ready. Your next right branch awaits my friends, reach out and grab it and remember to laugh. Let’s have lots of fun en route! As of January 5th I will be increasing the cost for my private sessions. I find as I update and my psychic abilities increase, I am able to channel more and offer more energetic healing. As a result, the energetic exchange needs to increase as well. The new rates will be $350 per session. For the month of January I will be offering a reduced rate for a pre-paid package of 10 ($300 per session for 10 sessions / $500 discount).